When this testimony filtered over to the Greek-thinking Christians--people who's worldview had been steeped in the ideas of Plato--the New Testament seemed to present a mass of contradictions. The only way the four statements could be reconciled was by either dividing God up into three parts or by describing a single God as appearing in three different ways depending on circumstances. Both of these contradict scripture, however. God can't be divided into three parts, as that would make God into three Gods which violates the fourth point. And God can't be described as appearing in three modes because there are places in the Bible (e.g., Jesus' Messianic baptism) where all three "modes" are present at the same time! For those of us who accept the Word of Truth, one solves problems like this by examining the worldview of the writers, interpreting their writings in the light of that view, and then finding the right way to express the same testimony in the culture receiving the gospel. This is the work of the missionary, and it is for that reason that the historical development of the doctrine of God might be described as a missionary process. Consider this as an example: Rom. 8:29 says that Jesus was the "firstborn among many brothers." How does one interpret the word prototokon , translated here as "firstborn"? The Greek thinker would understand firstborn as an event. Each brother had a birth event, and the firstborn brother would be born before the others. Therefore the passage must mean that Jesus was born before the foundation of the world--but he was nevertheless born--and therefore there must have been a time before that birth when he was not. The Hebrew would hear firstborn as saying "most important." That is, the brother who was firstborn was the one who would inherit a double share of the father's estate. So the passage means that Jesus is the chosen one among many brothers. The implications of these two ways of understanding that one passage would be enormous. For the Greek-thinking Arius, who took one side of the dispute, it meant that Jesus was not eternal and therefore not God, but a mere creature that had been made just like the angels and humankind (this is the Johovah's Witness position--they are among today's "Arians."). But to such Hebrew-thinking advocates as Athanasius, the passage meant that Jesus was the pattern to which Christians would conform upon their conversion--so Jesus had to be God as he would otherwise not be able to be the instrument of salvation. Disputes over this question, both inside and outside the church (sometimes in the form of riots) threatened Emperor Constantine's intentions for the church. He wanted the church to be a unifying force for the Roman Empire, and could not bear this conflict. He summoned the bishops from all over the Empire and presided over a meeting at Nicaea that would be called the First Ecumenical Council. That council came up with the Nicene Creed, to which all modern Christians subscribe. In the event, the debate continued to rage for decades in the political arena and it wasn't until the work of three especially insightful men in Cappadocia that the "Trinity" could finally be settled in the Second Ecumenical Council of 381. The Nicene Creed, along with two more modern Protestant statements, is shown below. But as for those who say, There was when He was not, and before being born He was not, and that He came into existence out of nothing, or who assert that the Son of God is of a different hypostasis or substance, or is created, or is subject to alteration or change--these the Catholic Church anathemizes. In this Godhead, there is the Father, the Son, and the Spirit; being every one of them one and the same God and therefore not divided, but distinguished one from another by their several properties; the Father being from himself, the Son of the Father from everlasting, the holy Spirit proceeding from the Father and Son. >In the unity of the Godhead there be three persons, of one substance, power, and eternity; God the Father, God the Son, and God the Holy Ghost. The Father is of none, neither begotten, nor proceeding: the Son is eternally begotten of the Father: the Holy Ghost eternally proceeding from the Father and the Son. The Trinity is the Christian doctrine of God. It tends always to be among the first targets of the cults and other outsiders who want to deny the testimony of the New Testament community of faith that Jesus is God. They reject the work of the church patristic fathers and substitute new doctrines derived by a straight translation of the text without considering the cultural differences. They ignore or grossly mistranslate other passages (Jn. 1:1-2) that have served as a guide to the interpretation of such passages as Rom. 8:29. Christians are vulnerable to these arguments that repeat the ancient error of Arius because few have taken the trouble to really understand this doctrine and because Westerners are vulnerable to the seduction of arguments that appeal to philosophical (that is, "Arian") thought. While less systematic about it than the cults, many evangelicals probably suffer under misunderstandings that are equally grave. They picture three thrones in heaven, occupied by three gods, each of whom have a separate "stream of consciousness." The problem arises from our tendency as Western thinkers to start with three "gods" and to then try to find a way to reckon them as one. Attempts to build analogies (one to the third power is still one, clover has three leaves, water-ice-steam, etc.) are fraught with problems and have not blessed the church. They either convey the error of tri-theism or modalism, and utterly fail to convey the very essential relational nature of the Father, Son, and Holy Spirit. It is better to work in the opposite direction, beginning with the absolutely foundational "shema" of Deut. 6:4, a verse that all Jews and early Christians would repeat daily in their hours of prayer, "Hear, O Israel: The LORD our God, the LORD is one." See also Isa. 45:5. The doctrine of God needs to be seen from its roots in Judaic monotheism; it is the flowering of monotheism. This keeps the focus of the doctrine on relationship, both on how God relates within himself and on how he relates to us and we with him. Father God as the Subject of Revelation Revealer. Creater, Lord of Existence. Son God as the Predicate of Revelation Revelation. Lord in the midst of our enmity. Holy Spirit God as the Object of Revelation Revealedness. The Lord who sets us free. Consider the Creation, for example. The Bible begins with "In the beginning God created the heavens and the earth ... and the Spirit of God was hovering over the waters." The New Testament community understood that through the Son "all things were made; without him nothing was made that has been made" (Jn. 1:3). So the whole of God participated in the Creation. This concept needs to be extended to every single act of God. All three of God's "ways of being" are involved in absolutely everything that God does. Why is the doctrine of God important? Because it teaches the essence of how we can relate with God. The Father begets the Son and the Son is begotten by the Father--but this begetting is not anything like the process of biological birth, which we understand as an "event." If we regard God as being an eternal event, however, we can begin to capture the idea of "begetting" in terms of relationship--so the Son is eternally being begotten and the Father is eternally begetting (see the Westminster Confession, above). The picture is completed by understanding the Holy Spirit as eternally proceeding from both the Father and the Son (see the figure). This concept is constructive when the Christian worships for this reason: because of our status of being "in Christ" and members of the family of God, we have the privilege of participating in the relationships within the God head. Having said all this about the relational unity of God, it nevertheless is helpful for us to look at the Father, Son, and Holy Spirit independently. But the reader should be strongly cautioned to keep the unity of the Trinity fully in place at all times. The Bible gives absolutely no encouragement to the ancient folly that one can know anything about the nature of God by speculation, reason, or meditation. We cannot construct God by taking pieces of world religions or the "insights" of an Eastern guru and pasting them together until they take on a form that is pleasing to us, but we must accept God as He is. Because God wants us to return His love, He has provided a means for us to know Him--know Him in a relational sense, that is. Any attempt to know about God--that is, to know God in a cognitive sense--is to treat God as an object that has attributes and to then debate those attributes. While still a popular approach among some Christian theologians, The biblical authors were Hebrews, not Greeks. They knew God through what He did. Simply put, God acts. It is through the things that God has done over the "history of salvation" that we can know anything about the nature of God (see the doctrine of Revelation). When one thinks of a parent, spouse, or close friend, one bases knowledge about the nature of that person on one's relationship with him or her. One does not catalog vital statistics about that person and concern oneself with attributes. It is the same with God. The Hebrews had a long relationship with God and learned of his nature through his actions. God is consistent (Heb. 13:8) so we can know God's nature by making a study of his actions in history as revealed by the inspired record of Scripture. The following table shows just some of the testimony of Scripture about the nature of God. The approach taken here is to engage God in dialogue. We examine past actions of God and then we ask what God is doing in each case. That is the Hebrew approach. Holy Isa. 31:1-3 God is other. He is not like us. Isa. 45:11-12 So holiness is that part of the nature of God that is different, separate, and other. Righteous Neh. 9:8 God is righteous. He rules justly. Ps. 9:4 He keeps his promises. Isa. 46:12-13 He brings salvation even to those who are unrighteous. Love Ex. 34:6 God's love is so much greater our answering love (or any sort of human love) that the Hebrew Scriptures reserved a separate word for God's love--a word the embraces the nuances of mercy, loving kindness, and a total lack of any need for reciprocity. Ezek. 16 It is a suffering love. Deut. 7:6-8 It is not based in any way on the worth of its object. Deut. 6:5. It can become "jealous" when rejected. Rom. 5:8 God's love is sacrificial, even to God's willingness to abide the death of his son on the cross. Expressing Wrath Amos 3:2 God resists evil. Deut. 1:34 He punishes unrepented sin and disobedience. Isa. 1:23-24 He acts against injustice. Amos 5:18-20 The eschaton will bring a final "Day of Wrath" (Dies Irae) that will represent a just redress of the sin of the world. Sin is something that one needs to take seriously. Isa. 28:21 N.B., God's wrath is not basic to God's nature in the sense that his love is. Wrath is God's "strange" work. One can say that God is a "God of Love," but one can never describe God as a "God of Wrath." If Jesus was not fully God, he would be powerless to implement the promises of salvation and eternal life that he had made. If there was any part of Jesus that was not fully man, then that part of us would be unredeemable. This is the only position possible when the New Testament witness is considered. The New Testament was written by people who knew Jesus, walked with him, dined with him, who had observed the signs and wonders, who had seen him perish on the cross, and who had met with him in the post-resurrection appearances. There was the expectancy of the coming Messiah as a prophecy of the Hebrew Scriptures. There was the authority that Jesus had over Scriptures (Mt. 5), the Sabbath (Mt. 12:8), the temple (Mt. 12:6), nature (Mt. 8:26), sin (Mt. 9:2)--even "all authority" (Mt. 28:18). There was the choosing of the twelve, an act that needs to be understood as a reenactment of the choosing of the twelve tribes. There was the fact of the virgin birth. There was the way that Jesus addressed God as " my father." There was the fact that the New Testament witness calls Jesus "Lord." For example, Peter's equated "The LORD" (meaning God the Father) in Joel 2:32 with "the Lord" (meaning Jesus of Nazareth) in Acts 2:21. There was the fact that Jesus was viewed as eternal (John 1:1). Among the most significant statements of the nature of Christ is his identification as the suffering servant of Isaiah, his death being seen as completely fulfilling Isa. 53 and Ps. 22. This is a vital theme in Mk. Mark is full of passages that scholars have dubbed "The Messianic Secret" (Mk. 1:25, Mk. 1:34, Mk. 1:43-44, Mk. 3:12, Mk. 5:43, Mk. 7:36, Mk. 8:30, Mk. 9:9) because, in each case, Jesus follows a miraculous sign of his Messiahship with a demand that that sign be kept secret. He refuses to let the fact of his Messiahship go into the record until Mk. 14:62, a time after which he has been bound, beaten, and is approaching the peak of his suffering. The lesson is clear: Jesus did not want the witness of his ministry as Messiah to be seen in any other light than as suffering and serving love. When we celebrate Christ the Triumphant and Christ the Conqueror, we do disservice to the one who came to save us and fulfill God's promises to us through his very suffering. In the modern Western culture, one is tempted to begin a discussion of the Holy Spirit by listing things which he is not. He is not a "force" that can be manipulated by the faithful in order to achieve human goals. He is not a willing participant in liturgical attempts to glorify himself. In fact, the Bible testifies to the reticence of the Spirit and the fact that the Spirit glorifies Jesus Christ, not himself. Attempts to glorify the spirit over history have always been accompanied by doctrinal error and theological distortion. When one labors under the assumption that the Spirit is instantly available as a servant of the believer to bear on any issue, then one quickly loses interest on the Canon of Scripture, the teachings of Jesus, and just about everything else that the church has deemed to be important over its history. We believe ... in the Holy Spirit, the Lord and the Life-giver, who proceeds from the Father [and the son]. Who is worshipped and glorified together with the Father and Son, who spoke through the prophets. The bracketed phrase and the Son was added in 1012 by the Western church and led to the schism between Eastern and Western church because the former saw the latter as exceeding its authority. More important than this creedal impasse, however, is the fact that the Council's action simply addressed the personhood of the Spirit, rather than his work. The work of the Holy Spirit is well attested in both testaments. In the Old Testament, the Spirit is seen as manifest in particular places at particular times in order that specific needs be accomplished (the building of the tabernacle, facilitating the prophetic office, etc.). But the work of the Holy Spirit changed abruptly on Pentecost (Acts 2), just as foretold by the Old Testament prophets (Joel 2), John the Baptist (Jn. 1:33) and Jesus (Jn. 14:26). The New Testament community understood the events of Pentecost in the context of the Babel judgment (Gen. 11). Humanity had been building a tower in order to invade heaven, throw God out, and take over the creation. God responded by the twin judgments of scattering the nations and confusing language. As in all of God's judgments, however, God's merciful nature followed the Babel judgment with grace: He appeared to Abraham and promised that "All families of the World will be blessed through you" (Gen. 12:3). 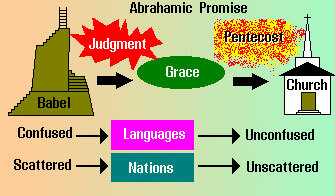 Pentecost is the reversal of the Babel judgment. All known nations of the world are assembled in Acts 2:9-11 and the speech of the Galileans is made intelligible to all those nations. The church, which is born out of the Pentecostal event, becomes the vehicle through which the promise that God made to Abraham will be carried out (Rom. 9:8-9). By fulfilling the promise that God made through Joel, Pentecost empowered the church by pouring out the Holy Spirit as illustrated in the figure. The Holy Spirit would now be the source of power for the church and indwell its members. The church would be the bearer of the Abrahamic promise to all humankind. The work of the Spirit in the churches is described in the "spiritual gift" passages (1 Cor. 12-14, Rom. 12-14, Eph. 4, etc. ), and is always presented in the context of the corporate, local church that Paul calls the . 1 Cor. 13, the "love" passage enjoyed by so many Christians today, is a corrective of the notion that these gifts are given to individuals and then used as the object of boasting. Through the gifting of the Holy Spirit, the church receives its power to function in the world. It should be noted that the miracle of Pentecost (the unconfusion of languages) is symbolically repeated throughout Acts as additional people groups are symbolically included in the Pentecostal miracle. That miracle is that of bringing clarity to the unintelligible, not the other way around (glossolalia, or "tongue speaking"). The latter is a legitimate (but completely different) gift of the Spirit, but not all Christians receive that gift (1 Cor. 12:30) and the gift is to be very tightly controlled when the church is assembled (1 Cor. 14) lest that it be a "resounding gong or a clanging symbol."